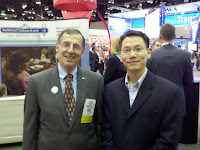 I'm currently at HIMSS11 and I had the pleasure to connect with William Cast, MD. He's the Chief Executive Officer of NoMoreClipboard. We spoke about some of the exciting things happening with his company and we discussed various types of non-clinical career opportunities in the health information technology industry. Bill is a practicing ear, nose and throat surgeon and our resident voice of the physician, ensuring that we consistently deliver value to consumers and medical professionals alike. Bill is responsible for driving enterprise growth, with a focus on creating and sustaining relationships with the medical and academic communities. Bill is also president of the Indiana University board of trustees, and has a rich entrepreneurial history – having served as founding president of an IPA and a medical liability insurance firm, founding chairman of DuPont hospital in Northeast Indiana, and publisher of a medical economics newsletter.